Nausea and vomiting during pregnancy is a frequent complaint of pregnant women and has been reported by over 50% of pregnant women. NVP may even be the first pregnancy symptom or sign. Most women with NVP have symptoms limited to the first trimester, some report it also in the 2nd and 3rd trimester. There is a big difference between mild and severe NVP and women with severe nausea and vomiting during pregnancy may have hyperemesis gravidarum (HG), an entity distinct from NVP, which if left untreated may lead to significant maternal and fetal morbidity. 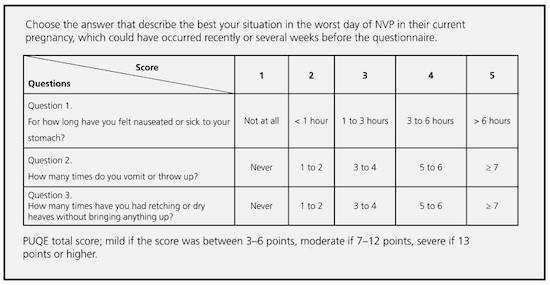 Answer these 3 questions and we can let you know how severe your NVP symptoms are.